Lakeith Stanfield may be reuniting with Jordan Peele for the upcoming Candyman sequel. We learned back in November that Peele's Monkeypaw Productions had officially closed a deal with MGM to bring this "spiritual sequel" to the original horror classic to life. With shooting set to get underway this spring, the casting process has begun and Peele is looking toward one of the stars of his hit directorial debut Get Out to take on the lead role. 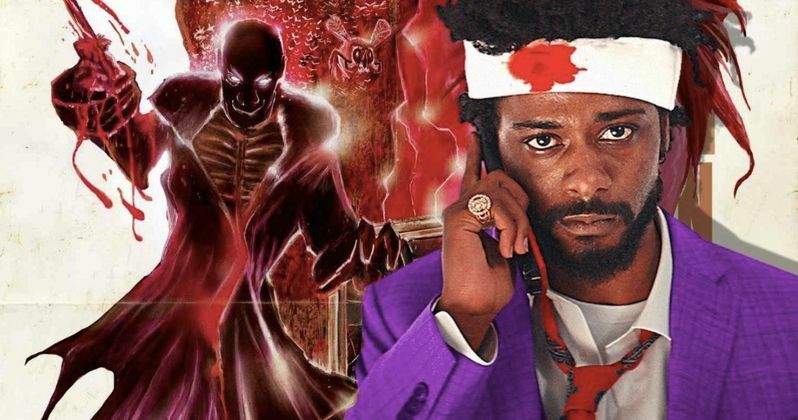 According to a new report, LaKeith Stanfield is in talks for the lead role in Candyman, but it's probably not what it sounds like. Stanfield will not be up for the titular character, originally portrayed by Tony Todd in the 1992 movie. Instead, the actor would be portraying a new character named Anthony, an inquisitive man living in Chicago who begins to research the urban legend known as Candyman. Not surprisingly, once he starts snooping around, people begin to die. It's said that Stanfield's character will bear similarities to the character played by Virginia Madsen in the original. This casting would make perfect sense. Not only is Lakeith Stanfield an incredibly gifted actor whose star power is on the rise, but he and Jordan Peele have worked together, very successfully, in the past. Peele is producing this time around, with Little Woods director Nia DaCosta in the director's chair. Outside of Get Out, Stanfield also starred in the critically-acclaimed Sorry to Bother You last year, as well as The Girl in the Spider's Web. This year, he's set to star in Rian Johnson's Knives Out and A24's Uncut Gems alongside Adam Sandler. As of this writing, no other names have come up in terms of casting, but Tony Todd has expressed his desire to reprise his role as Candyman. Given that Jordan Peele is aiming to make this something of a sequel, as opposed to a complete reboot, it's not at all difficult to imagine that Todd could be revisiting the role he's most well known for. If not, whoever they do cast will have some big shoes to fill. Peele previously stated his love and respect for the original movie, calling it a "landmark film for black representation in the horror genre." Candyman is based on a short story written by horror legend Clive Barker. The original movie was released in 1992 and did well with critics and performed well from a financial standpoint. Two sequels were made in the years that followed, Farewell to the Flesh and Day of the Dead, neither of which did nearly as well as the original. As such, the franchise has been collecting dust for the last 20 years. Now, one of the most promising names in horror is bringing it back with an up-and-coming director and rising star. Candyman is set to hit theaters on June 12, 2020. This news was originally reported by Super Bro Movies.